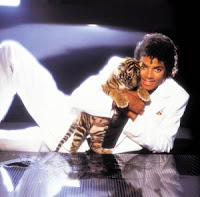 Don't be sad about MJ... let's celebrate his life! I've been listening to this mix from KMEL's Scotty Fox on repeat since I got it yesterday afternoon. You can download it here. Thanks Scotty Fox for honoring the greatest entertainer of our time. If I was going to start making cheer mixes I would include some of Michael Jackson. A lot of his stuff is upbeat and fun. It is a great idea to use Michael Jackson music for cheer mixes! He was one of the greatest dancers ever, so it makes sense that he would make good dance music! I really like the picture, too!